I want to take a few minutes to bring you up to date on the discussion concerning possible bell schedules for the 2019-2020 school year. Three weeks ago, I shared our initial proposal and rationale for adjusting our school bell schedules and invited public comments. This was done to gain a better understanding of the potential impacts of this proposed transition on students, teachers, and parents. As of today, we have received over one thousand individual comments on the web link and on our district Facebook page, many in support of the proposal, and many others opposed, with strong opinions on both sides. A link to the previous article can be found HERE. I want you to know I appreciate every comment and point of view. The district is striving to be thorough and transparent as we work our way through this important process. It’s impossible to do this without your honest and relevant input. Thank you! We knew going into this process that a discussion of this scope would inevitably spark some disagreement among various groups in our school district and community. A decision to transition to a new bell schedule … or not to transition ... may affect individual students and families differently based on their unique work schedules and family situations. Regrettably, there will be people frustrated, disappointed, and inconvenienced regardless of the direction we take. Therefore, our goal is to arrive at the best decision for the majority of our Spartan students and families. In additional to reading every comment, we have spent considerable time over the past few weeks visiting with site leaders, teachers, parents, and students to openly discuss some of the feedback. The additional suggestions obtained through this process have helped us to reexamine the original proposal and address some of the more significant areas of concern. While the research on the benefits of a later start time for secondary students is substantial, we understand the potentially negative effects on younger students and their parents, particularly related to bus pickup times and the increased need for after-school supervision. Additionally, while many freshmen and sophomores have asked to retain the flexibility to take a seventh class for more elective offerings, we have received feedback from high school juniors and seniors that adding a seventh class offering is NOT desirable. This opinion from students is based on the fact that many already have challenging course loads - often involving AP classes, Career Tech programming, or concurrent enrollment. The scheduling of extracurricular activities, athletics, and work schedules also limit our students' time in the late afternoon. According to data from our HS counselors, just under 4% of juniors and seniors enroll in a seventh period class. However, in the freshmen class, about 30% of students take a seventh class. As sophomores, this number goes down to about 20%, but is still significant. Yet, as we analyzed the possibility of a seven-period day for ALL students, it became clear that it would be very difficult, if not impossible, to add this number of elective offerings to the high school course guide next year. There was also concern from teachers and students about shortening the length of class periods to enable a seven period day at the high school due to the resultant loss of instructional time and heavier homework load which might be placed on students. Given these considerations and others, along with a more detailed analysis of possible transportation options and schedules, we have revised the original proposal. The latest proposal (below) is designed to hopefully address the more significant concerns, while remaining mindful of the original rationale and desired outcomes. Therefore, this newest proposal still reflects a switch of elementary schedules to an earlier time. Moving the elementary and intermediate start times to 8:00 a.m., instead of the 7:40 a.m. time originally proposed. This would also incorporate a plan to have almost all Bixby elementary students picked up by school transportation no earlier than 7:15 a.m. The end time for the elementary sites would move to 3:05 p.m. with aftercare available at parent cost. Early release Friday's would end at 2:05 pm. Secondary sites (grades 7-12) would remain on a six-period day beginning at 8:45 a.m. and ending at 3:47 pm. This will only be about 10 minutes later than the current release time for the majority of juniors and seniors. Extracurricular activities would be restricted from meeting or practicing prior to 7:30 a.m. during the school week. Students desiring a seventh class offering would be permitted to enroll in a virtual course or in a limited number of on-campus offerings beginning at 7:45 am. If feasible, we are also considering the possibility of offering transportation from designated points in the district for secondary students taking an earlier class. We would like to get your feedback on these proposed changes prior to our next discussion with the Bixby School Board on February 14. A link to a new survey can be accessed HERE. 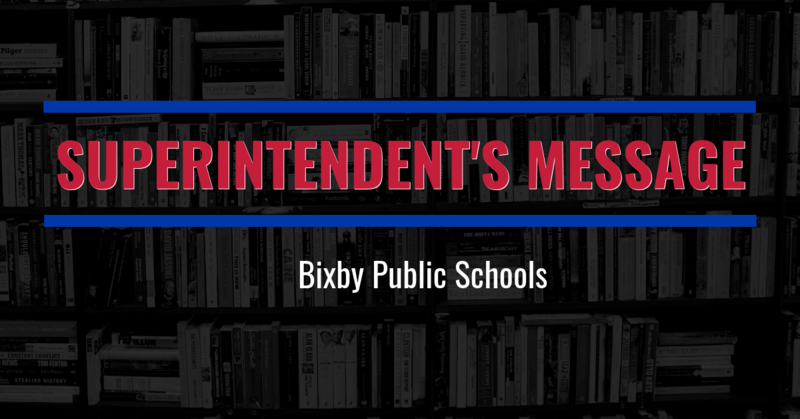 Thank you again for your participation in this important process and for your support of Bixby Public Schools.